This collection of ghost stories and strange myths brought to you by the Webb County Heritage Foundation, documents many of the region’s most popular and notorious tales of spooky occurrences and unexplained phenomena. 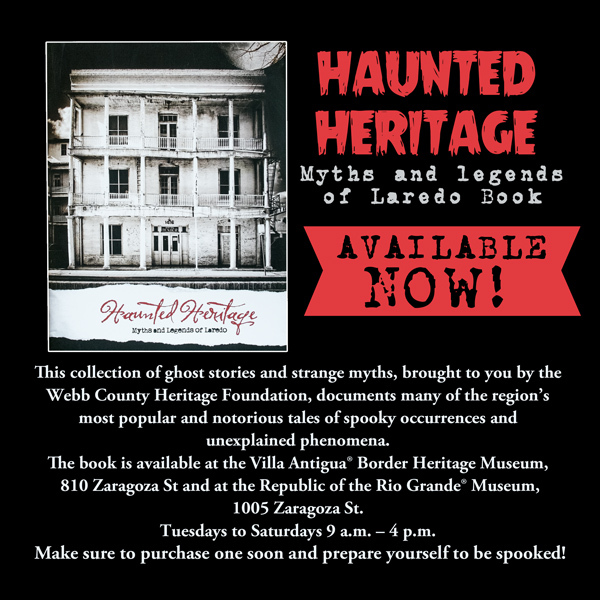 The book will be available at the “Haunted Heritage” exhibit on display throughout the month of October at the Villa Antigua® Border Heritage Museum, 810 Zaragoza St. and at the Republic of the Río Grande® Museum, 1005 Zaragoza St. Make sure to purchase one soon and prepare yourself to be spooked! For more information, contact the Webb County Heritage Foundation at (956) 727-0977 or visit us on Facebook.